Sonance VP66R 6.5” Round Ceiling Speaker Pair. New. SONANCE LS47SAT LANDSCAPE SERIES SPEAKERS...BRAND NEW! Sonance Sonarray SR1 SubWoofer - Single - 93139. Shipped with FedEx Ground or FedEx Home Delivery. Adjustable-Width Soundbar. Discreet and minimalistic industrial design blends-in with most flat screen displays. This pair of speakers is used and work fine. They will each come with the mounting bracket you see pictured. I offer a 39-day guarantee on these!! 1 (NOT pair) Sonance Cinema. 5 LCR In-Wall Speaker. Crack in plastic near tweeter. See photo. Crack does not affect sound. 1 Pair Sonance Symphony 623t In Wall Speaker- Brand new, never installed! Sonance Symphony 623T in-wall speakers. They have never been out of the plastic. 6-1/2" (165mm) Black glass composite cone with rubber surround. Weight (per speaker) (179mm x 286mm). 7-1/16" x 11-1/4". Number Of Speakers. Indoor Or Outdoor Use. Tech NOTE'S Good working condition. Wireless Multi-Room Audio. Peak Power Handling. Woofer Size. Number Of Woofers Included. Tweeter Size. NEW! Sonance Sonarray 125W Outdoor Speaker System - 8 Satellites and Amplifier! SONARRAY SR1 System w/ Amplifier. SONARRAY SR1 System. Listening Area: Up to 2000 square feet. Below-ground subwoofer with canopy hidden under foliage. Runs off a standard 2-channel power amplifier or stereo receiver. 5 out of 5 stars - NEW! 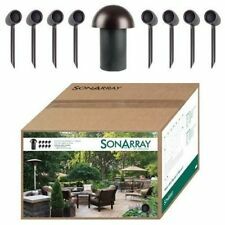 Sonance Sonarray 125W Outdoor Speaker System - 8 Satellites and Amplifier! 6 product ratings6 product ratings - NEW! Sonance Sonarray 125W Outdoor Speaker System - 8 Satellites and Amplifier! Trending at $2,075.00eBay determines this price through a machine learned model of the product's sale prices within the last 90 days. 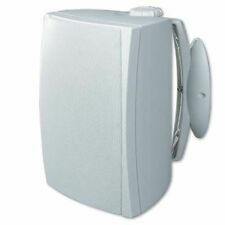 Sonance Mariner 54 Outdoor Speakers White -PAIR - 83148 X 2. Pair of Sonance 8 inch or 6 inch in wall speakers. 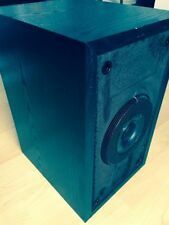 Pair of Sonance 8 inch or 6 inch in wall speakers. . Condition is Used. Shipped with USPS Priority Mail. Brand new, factory sealed, never opened. This is a PAIR of Sonance VP62R in ceiling speakers. I ship promptly via UPS. These were made in 1993. They are unused in original box. Box shelf worn. If its not in the Pictures its not included. We have nothing to do with this. We do not get the money. Open box, single speaker and bracket only. Never used. Never used. If its not in the Pictures its not included. We have nothing to do with this. We do not get the money. Never used. These were made in the early 90's. If its not in the Pictures its not included. We have nothing to do with this. We do not get the money. Sonance X8W Architectual Series 8" Subwoofer New in Box. Condition is New. Shipped with USPS Parcel Select Ground. Sonance - Mariner Outdoor Speaker. Want great sound without all the clutter of traditional cabinet speakers?. You have to go with in-wall HFW6. Installation is made easy with a patented Flex-Bar installation system. The system can be painted to match your decor and virtually disappears from sight. Up for pair of Sonance ceil speakers model S3R. Full model number 1985 S3R 70-00083 Speakers are in good working condition. The speaker covers have minor damage. I do not know the RMS power rating of the speakers. Measurements speaker 8" overall 9 3/4" Thanks for looking! View My Feedback. Sonance Moderno In Wall M6 Speakers. Moderno speakers feature new, low profile grilles with only a small trim that makes other speakers look old and obsolete. The paintable, highly opaque grilles blend invisibly into any designed space. Sonance X6S Archectitectural Series 6.5" 2 way Speakers. Condition is New. Shipped with UPS Ground. Marketing Information Sonance Symphony S623T in-wall speaker establish the benchmark for quality, performance and versatility. Product Model S623T. Manufacturer Sonance. Product Line Symphony. Sub Category Speaker. Never been used not in original box no accessories just the speaker. Pair of Sonance Symphony S622T in-Wall Stereo Speakers. Condition is Used. Shipped with USPS Priority Mail. Open box, single speaker. Never used. One 5 1/4" 2-Way Single Stereo Outdoor Speaker. The speaker is new and was only opened to check contents and take photos. There’s no reason for speakers to add clutter to a room with unwanted shapes, shadows, and angles. And there’s no reason to leave any detail of your. Woofer 4" (102mm) carbon fiber cone with a rubber surround. The Sonance Symphony Series, the next generation of 6-1/2" in-wall speakers, establishes a benchmark of performance and build quality. Technical advances in individual driver performance combined with Sonance's well-known crossover design capabilities establish new performance standards for in-wall applications. Sonance Symphony RS1 round surround speakers - pair – good condition. · Sonance Symphony RS1 Speakers - 1 pair. Flush mount with ceiling - light almond color. MODEL # VP46R. MAKE: SONANCE. SPEAKERS ARE NEW. MODEL: IN-WALL SPEAKERS. COLOR: WHITE. 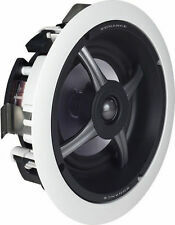 Sonance VP68R In-Ceiling Speaker Pair. New! A good speaker is a key to having a great audio experience. Speakers can be any size starting from the size of a baseball to the side of a refrigerator. eBay is a place where different types of Sonance speakers can easily be searched for and purchased. Full-frequency response loudspeakers - This type has several subcategories that depend on the frequency range. The full-frequency loudspeaker covers the full audio band of sound that ranges between 20 to 20,000 Hz. They are usually large in design. Restricted-frequency response loudspeakers - Most loudspeakers can play a range of sound from 45 to 20,000 Hz. This is the restricted frequency response category. They often come in 'bookshelf' sizes. Subwoofers - Subwoofers are meant to create very low tones from the audio dynamic range. A true subwoofer can produce a 20 Hz tone where the sound is no longer heard but felt within the body as a beat. Home-theater speakers - These have two front speakers and two rear or side speakers as well as a center channel. Sometimes the home theater speaker also has a subwoofer. What is the frequency range and balance? The frequency range of Sonance speakers measures the selection of audio that the speaker can reproduce. The frequency range gives information about whether the speaker can reproduce lower bass sounds or high pitch sounds. If the speakers reproduce mainly low frequencies, the sound will be more booming and very low-frequency reproduction can make the sound muddy and indistinguishable. High-frequency speakers sound bright. A balanced frequency range is the one that expresses both soft and loud tones as well as high and low sounds. What is a good space for speakers? The room in which you use the speakers has a big say in what kind of sound is produced. The sound should be heard from the place where the two main speakers are both heard. Rooms with reflective surfaces like wood, glass, and empty walls will create a harder sound, and soft furniture like a tapestry, carpets, and drapes can balance this out by absorbing and diffusing sound. When the speakers are moved, the sounds can be drastically changed. What are voltage sensitivity and power handling? Voltage sensitivity: Voltage sensitivity lets you know how much the speaker can play at a given voltage. This gives an idea about the size of the amplifier that will be needed to run the speakers. This is usually measured in decibels (dB) per 2.83 V of input. Speakers that are efficient have at least 86 dB or higher. Power handling: Power handling is the power measured in Watts that the Sonance speakers can take without being damaged. For example, a speaker with a maximum of 100 Watts is fine even for a 200-Watt amplifier per channel. The thing that can damage loudspeakers is having a very small amplifier and taking the sound to distortion levels. Content provided for informational purposes only. eBay is not affiliated with or endorsed by Sonance.